THQ has shed its budget software division and a European vice president. Like a crippled bomber tossing excess weight out the window as it struggles to stay in the sky long enough to make it across Allied lines, THQ appears to be doing all it can in a desperate bid to keep the lights on and turn things around. Earlier today the company announced the sale of ValuSoft, best known for stocking the shelves of mass-market retailers like Wal-Mart and Target with low-priced, "second-tier" games ranging from straight-up crap like 18 Wheels of Steel: Extreme Trucker 2 to semi-obscure and older but still decent releases like King's Bounty: Armored Princess and Battlefield 1942. ValuSoft was taken off THQ's hands by Cosmi Corporation, which claimed that the acquisition makes it the second-largest publisher of PC software in North America and the biggest "value software publisher," while THQ President and CEO Brian Farrell said the move reflects the company's commitment to divest itself of all but its most successful core franchises. "With the transition of the 'Value' PC business to Cosmi, our internal resources are now focused on our core videogame portfolio where we can drive the highest quality performance and execution for our games," he said. Rory Donnelly, THQ's long-serving senior vice president of European publishing, was also a victim of the cuts, as the company announced that his position was eliminated as part of its plan to streamline operations. 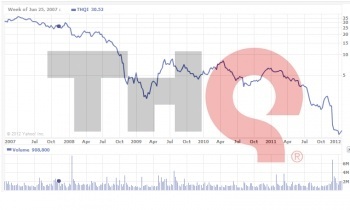 "As a result of this decision, Rory Donnelly will be leaving the company effective May 10," THQ said in a statement. "We wish Rory well in his future endeavors and we thank him for his 12 years of service to the company." It's still way too early to judge whether or not THQ will be able to stave off an ugly end, but it certainly appears to be pulling out all the stops. The company also got a spot of good news earlier this month, when its fourth-quarter financial results turned out to be not as bad as expected.